Bandar Sunway or Sunway Resort City is the first integrated township in Selangor. Spans about 7 million square feet in Klang Valley, the Bandar Sunway boasts the Sunway Lagoon Theme Park as the center of this complex. Sunway Lagoon Theme Park is a home for the biggest rides and the largest water parks in town. This is one of the main attractions that are visited by the major tourist here. The abundance of Sunway Hotels is opened around this area. And this recommendation is revealing the best of the best among them. The 5-star Sunway Hotel nestled in the heart of Subang Jaya, only 1.73 km from the Sunway Lagoon Theme Park. The exquisite hotel boasts over 450 well-appointed rooms and luxury suites. Set in modern contemporary decoration, the accommodations are fitted with the 5-star amenities, including the minibar, kettle, spacious writing desk, shoeshine, ironing facilities, high-speed internet, and plush bathroom. Dorsett Grand Subang hosts 4 dining houses serving the top class cuisines. The on-site facilities contain the swimming pool, fitness center, spa, and business-banquet center. Located only 1.40 km from the iconic amusement park of Bandar Sunway, this 5-star Sunway hotel provides the convenience stay by 383 units of guestroom and suite, designed in a modern setting. The entire rooms and suites are fully furnished, fitted with AC, TV, desk, large mirror, Wi-Fi, kettle, in-room safe, and bathroom. This high-class hotel also contains 9 selections of dining house, 5 swimming pools, gym, spa, sauna, sports courts, children’s playhouse, music room, library, business center, and more. 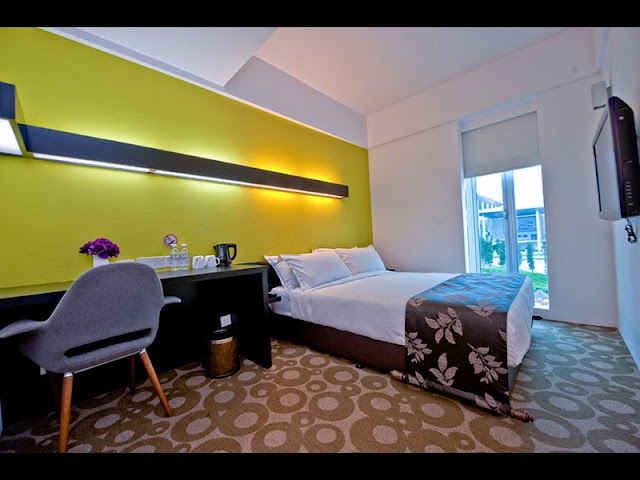 Situated only 1,17 km from Sunway Lagoon Theme Park, Ruemz Hotel is offering the 3-star vacation house within the campus environment. The modern minimalist boutique hotel hosts 82 rooms, fitted with AC, TV, kettle, desk, in-room safe, Wi-Fi, and bathroom. As the 3-star hotel, Ruemz also has a swimming pool, gym, and meeting services. The dining outlets are provided through the Syopz Mall that located adjoining to this Hotel. Click here to book this hotel! The 2-star Sunway Hotel is nestled on the roadside, within less than 2 km from iconic Sunway Lagoon Theme Park. You need only 5 minutes drive to reach that signature destination. Subang Valley Hotel contains 55 comfy rooms. Each room here is well maintained and features AC, LCD TV, desk, mirror, mini fridge, small bench, and bathroom. The Wi-Fi access and in-house restaurants are available on site. Actually, the hotel is also popular because the popular Japanese Restaurants in town are surrounding it. EV World Hotel Subang Jaya sits only 1.9 km away from the central Bandar Sunway, which hosts the Sunway Lagoon Theme Park. The 2-star hotel boasts only 21 guestrooms, set in modest decoration, very clean and tidy. Each room is fitted with AC, LCD TV, small desk, and a bathroom with separated shower and hot/cold water. There is the Quad Room type for the family or larger group of 4. The on-site facilities here is quite complete as the 2-star hotel, with the in-house coffee café, internet corner, luggage storage, ironing corner, tour arrangement, and the Wi-Fi throughout the property. Swan Cottage Hotel is nicely located less than 1 km from the Sunway Lagoon Theme Park, so you can just take a short stroll to reach the stunning entertainment center. As the place to stay, Swan Cottage Hotel is modest yet very well maintained. The hotel hosts nearly 42 fully furnished bedrooms that supported with AC, TV, desk, kettle, and bathroom. Wi-Fi connection is available throughout the area. Even the hotel has none of in-house restaurant; it’s very easy to satisfy your hunger since the eateries open in the neighborhood within walking distance away from this modest hotel. ShuddupNDance 2016 @ Klang Parade ! Move Your Body Zumba Party By Watsons 2016!